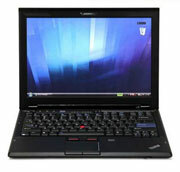 Posted on April 27, 2008 by Chad O.
TrustedReviews published a review of the 13.3-inch ultrathin Lenovo ThinkPad X300, Lenovo’s latest (and currently top of the line) ultraportable, last week. The team behind the ThinkPad X300 have said time and again (and rightfully so) that a lot more attention to detail went into the X300 than some realize, that it wasn’t simply an update to the ThinkPad X series. This entry was posted in Lenovo, Reviews. Bookmark the permalink.